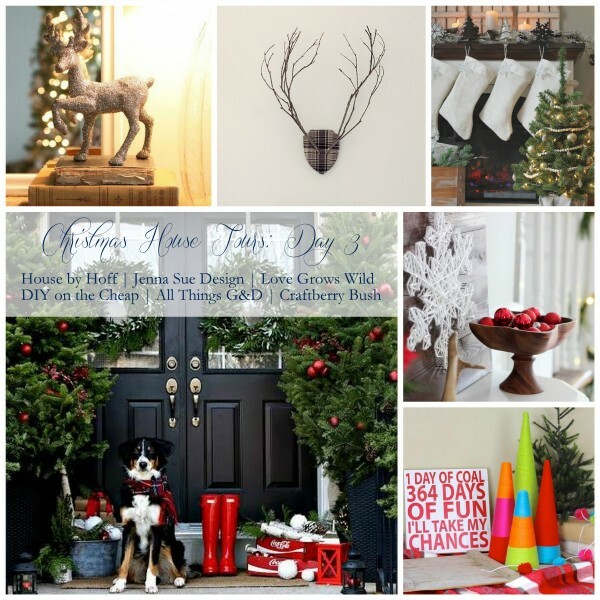 It’s holiday home tour time! This year I was invited by Jen from Migonis Home to be a part of her Christmas Home Tour series, so I baked up a batch of cookies, grabbed a couple bottles of wine, and joined the party! If this is your first time clicking to All Things G&D – welcome! I’m Dusty (that’s my name…and my home’s Facebook status). I live in Madison, Wisconsin with my handsome husband Greg (the G to my D) and our sweet daughter Kate. We’re selling our house this spring and looking forward to moving to a “grown up house” (I have an update coming soon! ), which means this will be our last Christmas in our current home. Decorating for Christmas has always been one of my most favorite things to do, but this year threw me for a loop. With a move on our horizon, G and I have been in packing up and getting rid of stuff mode, so it seemed counterproductive to haul out and unpack all my totes of glitter and good cheer. Part of me wanted to be a scrooge for a year and not do any decorating, but luckily I spend my days with a four-year-old little girl bursting with excitement over the holiday season to get me back in the Christmas spirit. 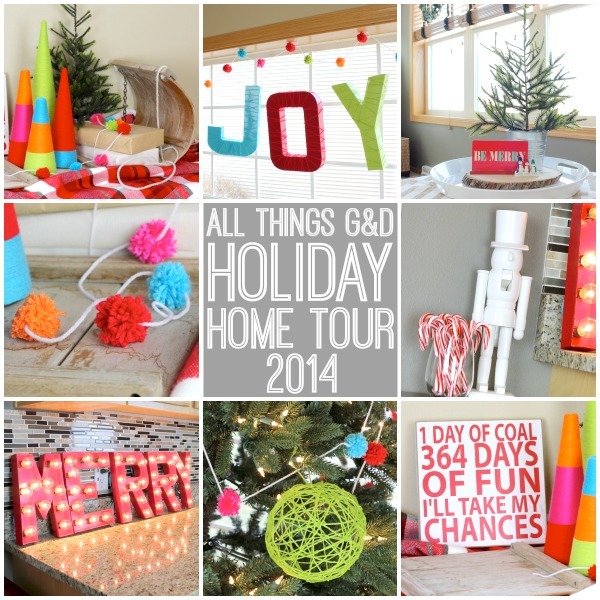 I hope you enjoy our playful, colorful, handmade holiday home! Let’s start in the living room! The little snowman figurine in front of the pine tree below was a gift from one of G’s friends when I was pregnant with Kate. It was the first time I’d ever seen our three names together on something, and it made me so excited for the little family we were about to create. This little snowman family makes me so happy, and always gets placed somewhere where I can see it often at Christmastime. A look into the living room from the kitchen, and the IKEA Tarva dresser I “hacked” to turn it into a kitchen sideboard. 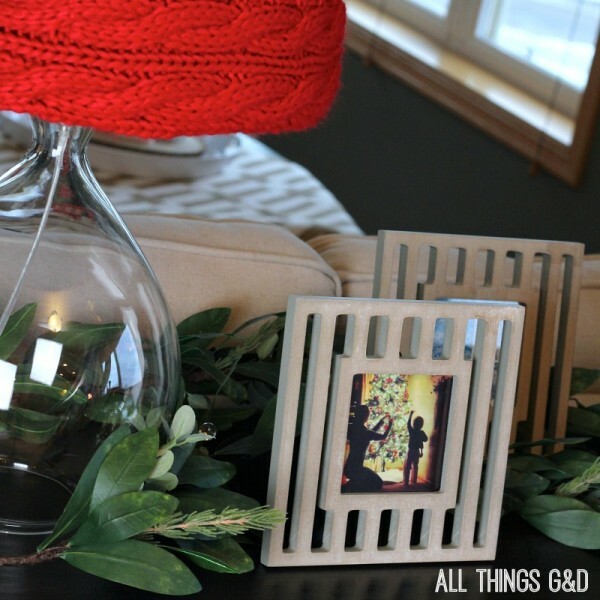 The lampshades are temporarily topped with cable knit scarves. Some photos from past Christmases top the sideboard, including this one of Kate and I decorating the tree when she was almost two years old. G doesn’t like real Christmas trees, so years ago I caved and switched to artificial ones. 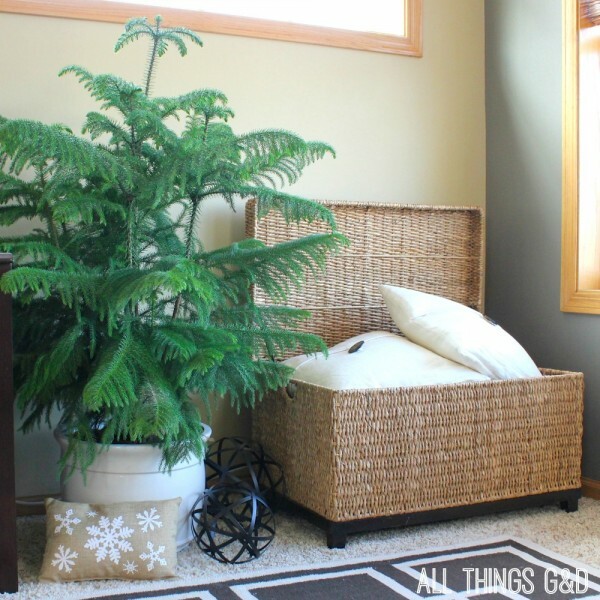 I recently spotted this beautiful Norfolk Pine at Home Depot and had to have it. 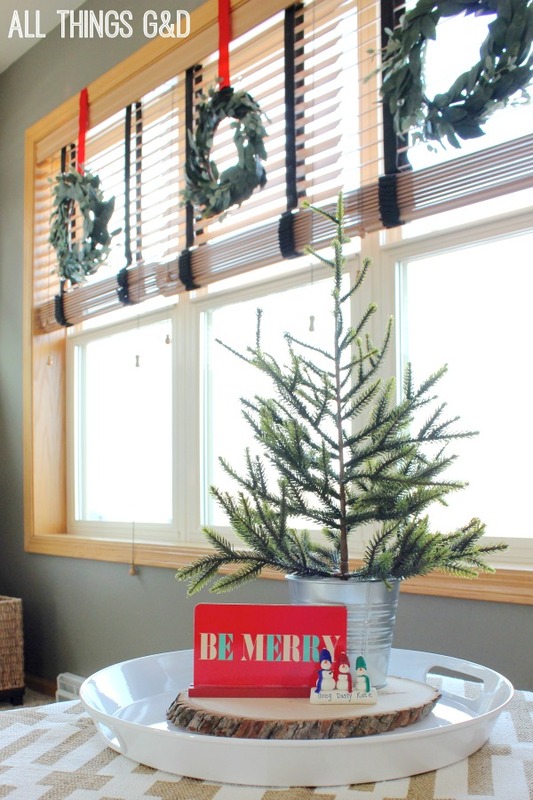 It makes me happy to have some real pine in our home during the holidays and now all year long! 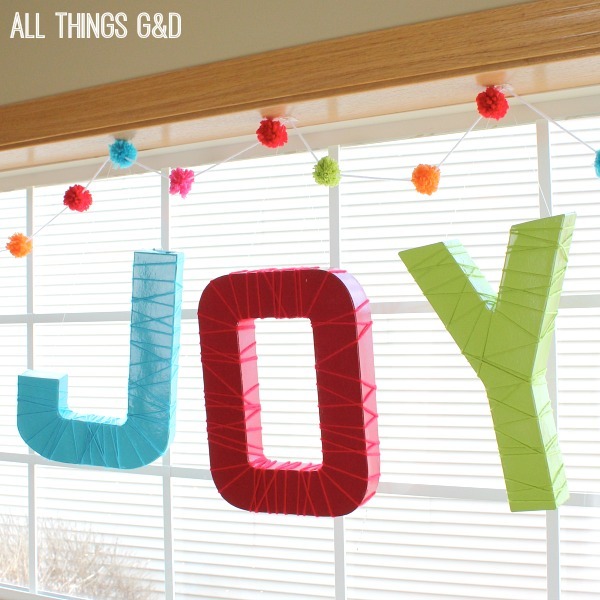 I made the holiday greetings hanging in the windows by spray painting cardboard letters and wrapping them in yarn. I then added some DIY pom-pom garland made from the same yarn. Our living room tree is “Kate’s tree” and it was decorated entirely by her. 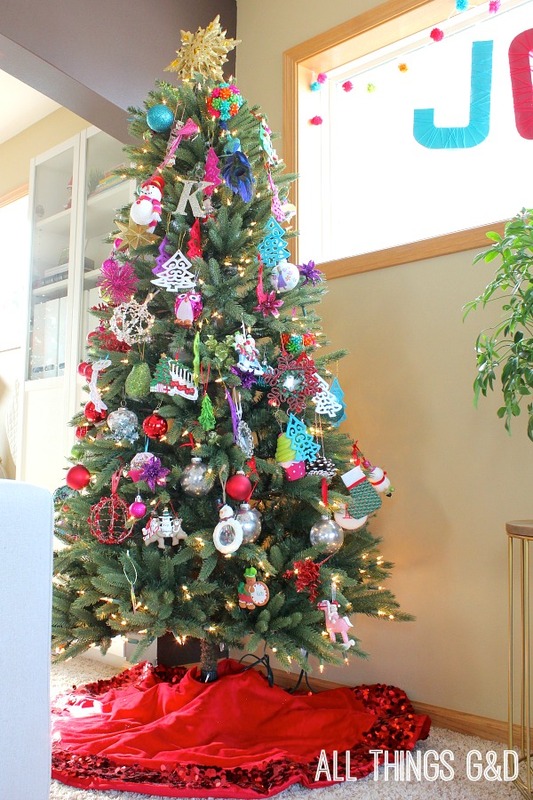 I learned my lesson from past Christmases whenKate plucked all of the colorful, sparkly, and/or personal ornaments from our big tree to put onto her tree that she cannot be contained. This year I just opened up the ornament bin and let her have at it! With no chimney, we hang our stockings from the windowsill. Santa knows what to do. I love this old sled! 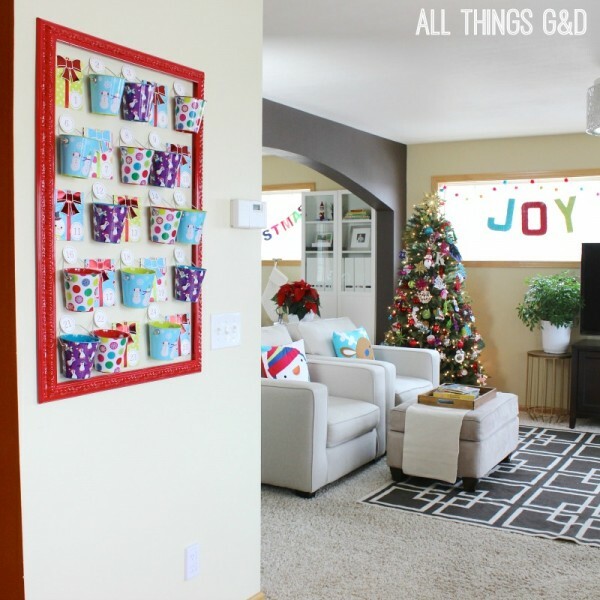 I filled it up with some presents and DIY yarn-wrapped Christmas trees, and handmade pom-pom garland. Our big tree in the front room is decorated entirely of yarn. 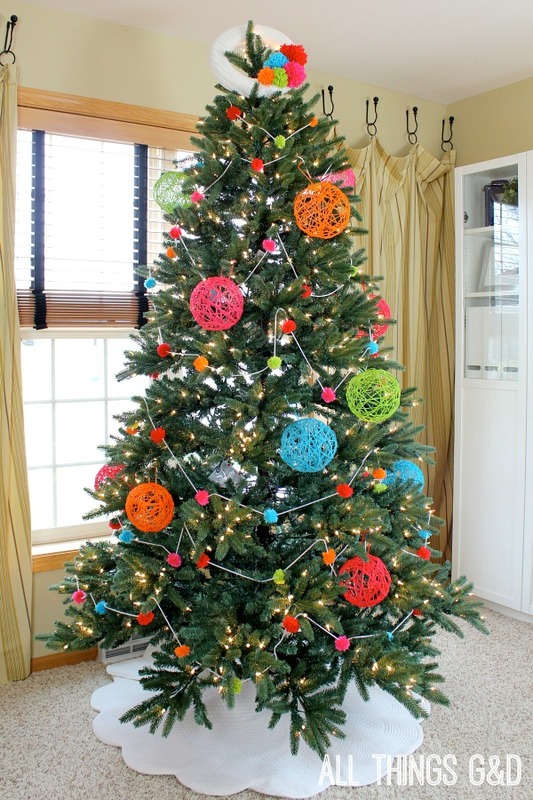 I wrapped it with DIY pom-pom yarn garland and added DIY yarn ball ornaments. I topped it with a wreath made out of an old cable knit sweater freshly adorned with larger yarn pom-poms. The kitchen – where the dinners are made and the wine is uncorked! 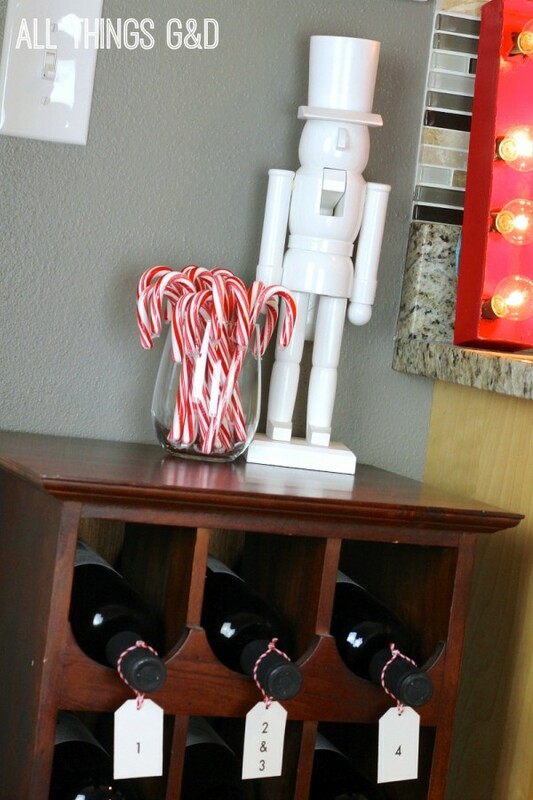 Our nutcracker, Chuck, stands guard over my wine. I hope you enjoyed this look inside our holiday home! There are 5 other bloggers showcasing their homes today that I’d love for you to visit, as well as all of the rest of the bloggers participating this week. Click on the links below to check them out! 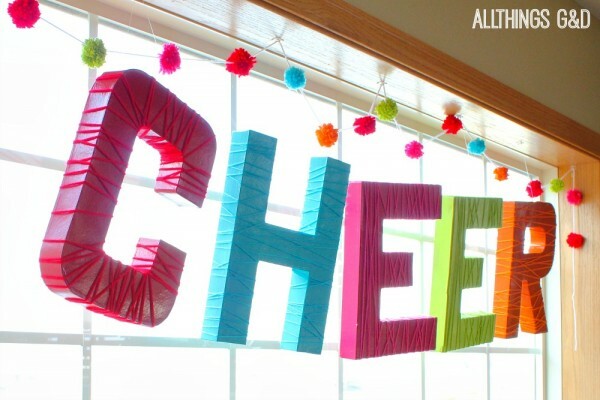 Love your use of bright colors and the letters you made! But my fave is the Mommy Advent Calendar! So clever!! Thank you so much, jezuri! That was super fun to do – and enjoy, haha! SO fun and festive Dusty! 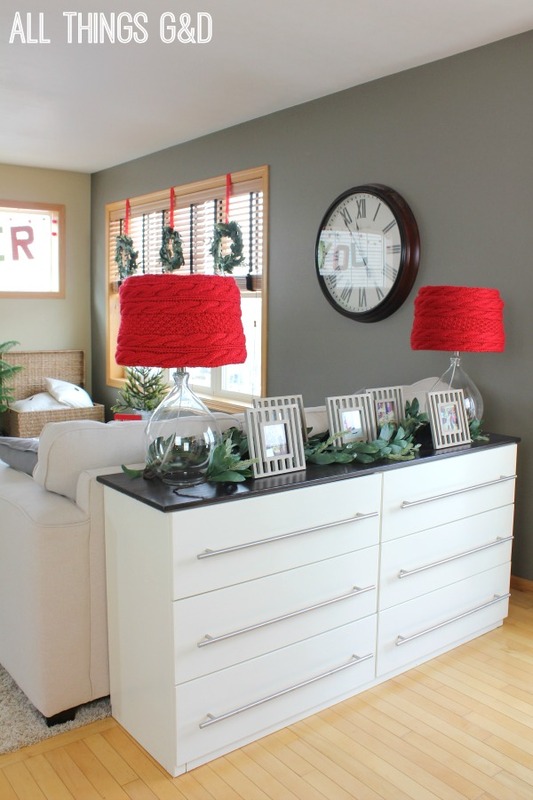 I absolutely love those sweater lamp shades. AND who doesn’t love a little, or a lot of colorful sparkle?! Thank you so much, Sonya! How fun and festive! The sweater lampshades are genius and I want that Merry sign! Thank you so much, Jenna Sue! That marquis sign was so fun to make. I’m sure it’ll be popping up in our holiday home for many years to come! Hi Dusty, would you consider doing a tutorial blog post of how you made the marquis sign? Love it so much! Oh sure, I’d be happy to, Jennifer! I know it’s a little late in the holiday game, but I’ll post a tutorial next week for anyone who would like to recreate this for next year. LOVE! I can’t wait for Christmas in the new house!!!! 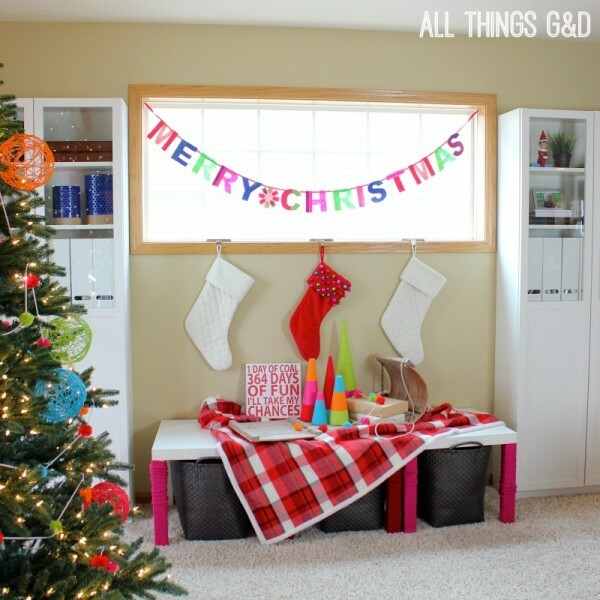 I need to know how to make that pompom garland, adorable! And cheap right? I just paid a ridiculous amount of money for felt ball garland, this would’ve been just as good! The MERRY sign is probably my favorite! I love that you let Kate decorate her tree, a mommy after my own heart! Great tour! 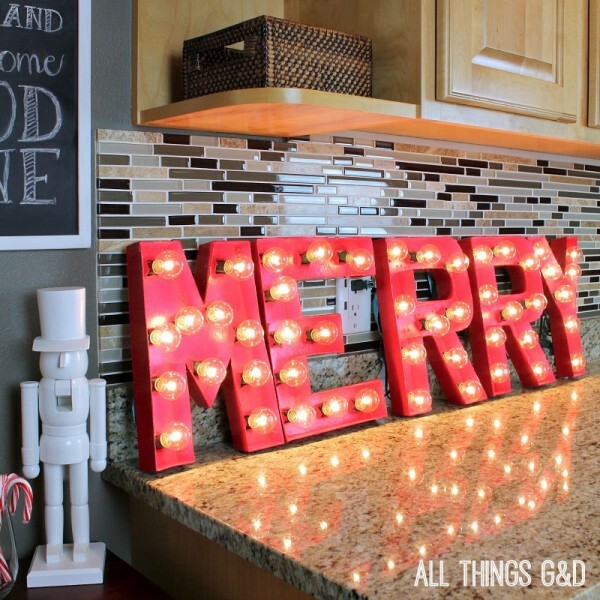 I love the MERRY marque letters and all of the bright colors! Thank you so much, April – so sweet of you to say! I love all the pretty colors! 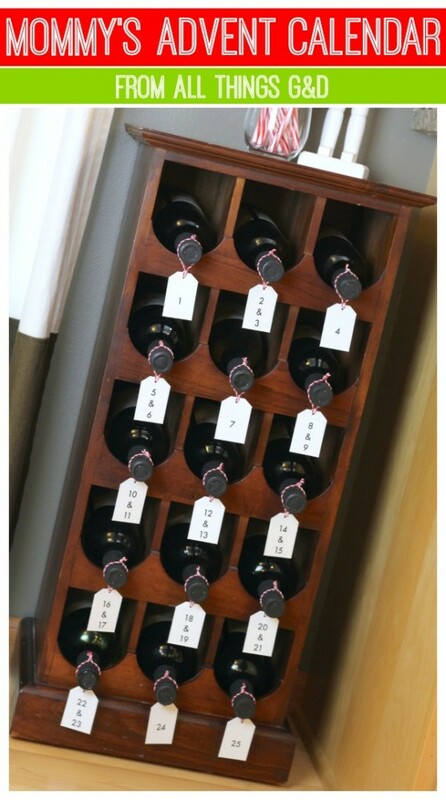 And oh my goodness that wine advent calendar — genius! I know I’ve mentioned before that I’ve been a fan since thenest. It’s been great seeing your house evolve over the years. 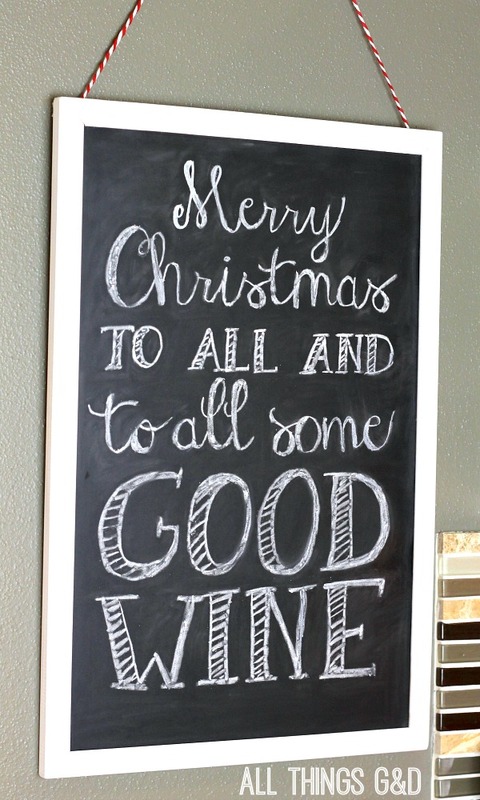 I’ll be very honest that I’m disappointed I didn’t get to share in the wine consumption while you painted your house! And if I weren’t across the pond (aka Lake Mich), I’d consider packing up and buying your house! What things don’t you like about your house? It is such an honor to have longtime readers like you, Ashley – thank you SO MUCH!!! Maybe you can share in the wine consumption while we paint the next house! My first order of business after we move in will be having a fully stocked wine rack. 😉 It would seriously be so awesome to sell our house to a reader!! Any plans to relocate to Madison, WI? 😀 This is such a wonderful house but G and I are small town kids and we’re looking to get Kate in a smaller school district that’s outside the city. She starts kindergarten next fall which is craziness to me!! 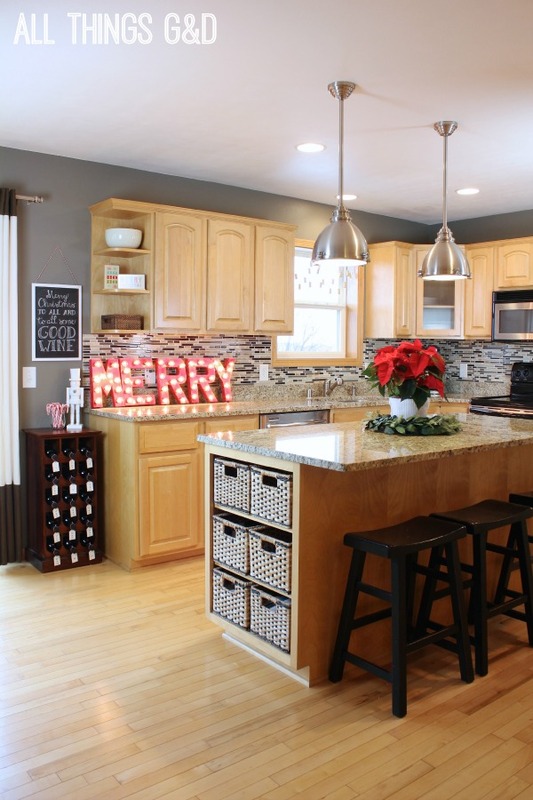 What a whimsically fun and cheerful holiday home! Thanks for the inspiration! 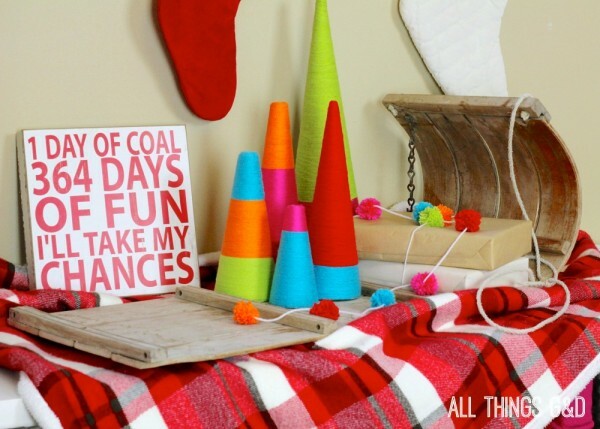 That “one day of coal” sign – totally one of the reasons I love you! And all this colorful goodness! Oh you know that sign was made for me. Thank you so much, Jenna! You are the only house in that list that doesn’t have white trim, I love seeing the wood trim. Thank you, Sarah! We make it work. I love all your bright colors! So festive and cheerful. I love your “1 day of coal” sign! 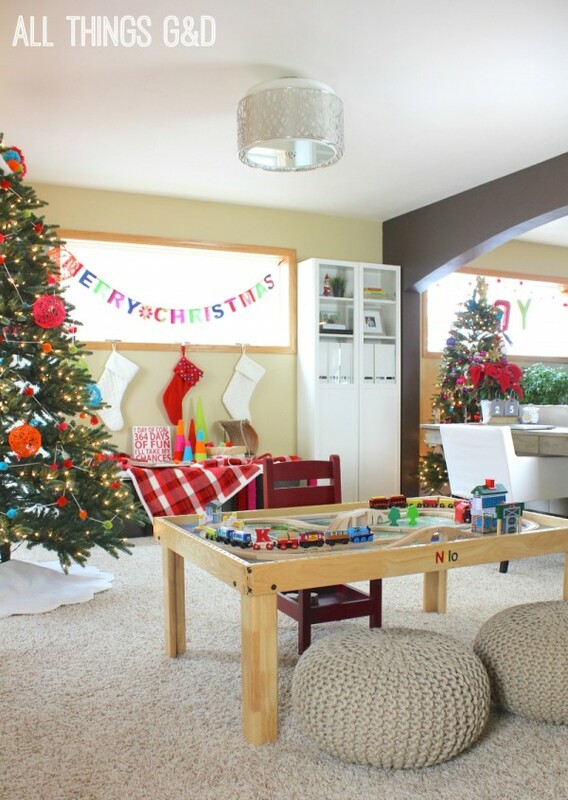 Such a bright, fun space for the holidays! Thank you so much for your compliments and well wishes, Shannon – so sweet of you!! so festive and fun but my favorite part is mommy’s advent calendar: LOOOOOOOVE. THANK YOU FOR BEING A PART OF THE TOUR, DUSTY! Thank YOU so much for organizing this, Jen! It was a ton of work on my end to create the post, so I can only imagine all the work you had on YOUR end coordinating it all. You’re amazing. Thank you! Your home looks so pretty! I absolutely love the marquee sign in the kitchen! Thank you so much, Gilly! 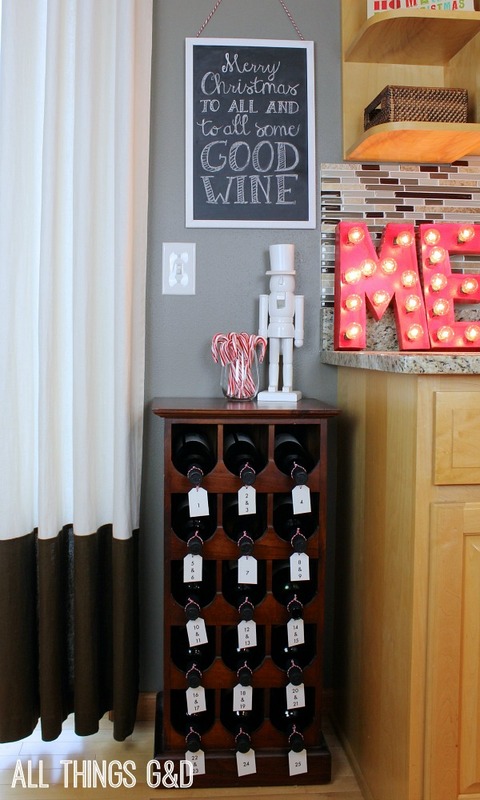 Okay, that Merry sign in your kitchen is to die for! Love love love! Your house is the cutest! Thanks for sharing! Thank you so much, Brie!